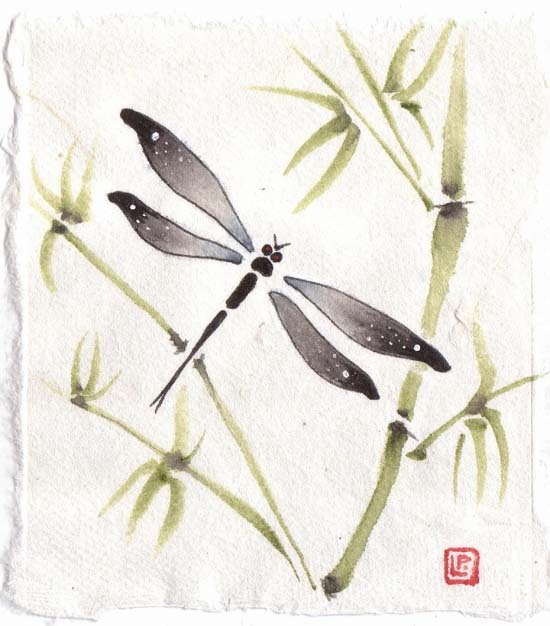 Sumi-e dragonfly original brush paintings to go! 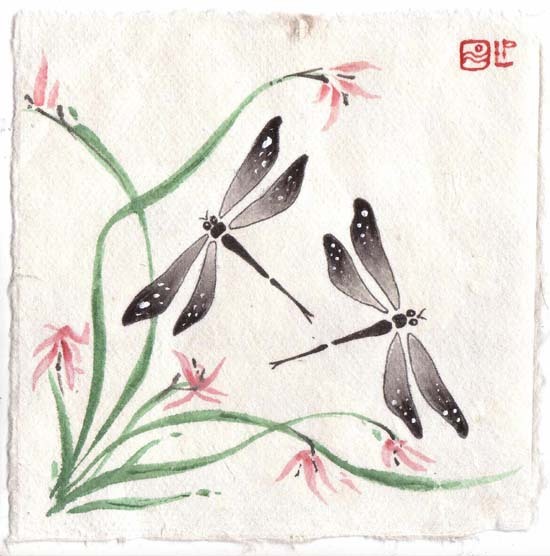 I’ve created some new paintings featuring beautiful Dragonflies, done in Sumi-e Japanese / Chinese brush style on acid-free handmade mulberry bark paper which has a lovely silky surface texture. I love creating anything to do with dragonflies : they have a unique meaning across many cultures, symbolising transformation, ressurrection and enlightenment as they are born wriggling in the water, and transmute into stunning winged creatures of the air…..
You can see more of my original Dragonfly Artwork and Jewelry design here. Thank you for stopping by – I’ll soon be posting more new paintings in an Owl extravaganza ! Our good friends supplied me with some gorgeous handmade mulberry bark paper from Thailand – where they deal in fair trade amongst various communities. This paper is also known as Rice Paper but it is made from Mulberry trees. It is beautiful to paint on in a spontaneous, direct way much like the Chinese style of brush painting called Shui-mo.. I am looking at plants, insects and flowers in a completely different way now- in terms of their essence and how to capture this in a few simple brush strokes. 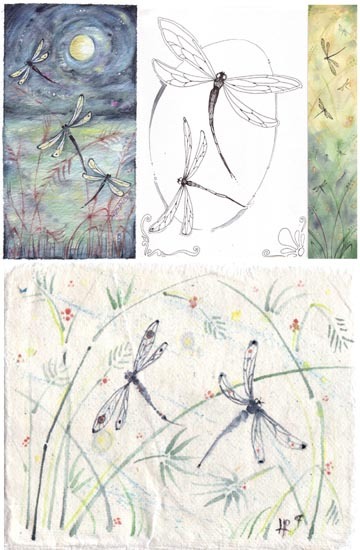 Thought I’d quickly post this collage of new Dragonfly works that I have obsessively been painting on scraps of lovely paper left over from my Printmaking. The first one is a dragonfly sojourn at midnight under a full Moon – kind of dark but I like that … and the black & white drawing is still a work in progress, so we will see how it develops. The bottom one is a Japanese-style watercolour painting on beautiful handmade Mulberry bark paper from Thailand – this kind of textured natural paper is really interesting to work on – it is not a watercolour paper so does not allow the paint to blend on the surface- more suited to quick line work. Here is an original for sale. They were very popular during the Art Nouveau era as they are so stylistically suited to the flowing organic forms of Nature depicted by the designers of that time. Tiffany and Lalique have some of my favourite pieces of dragonflies- so inspiring ! thanks for looking – there will be some darker stuff coming soon….